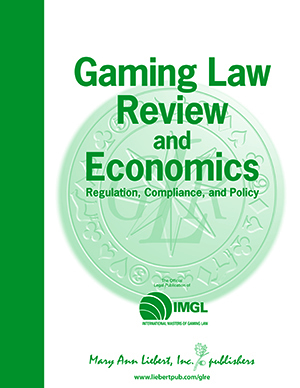 Gaming Law Review and Economics (GLRE) is the leading peer-reviewed journal addressing important regulatory and economic issues facing today’s gaming industry, particularly as the Internet begins to play a larger role. With its authoritative coverage of the legalities of intellectual property and licensing requirements, past and current litigation, and tax issues, the Journal is cited more often by legal courts than any other journal. IMGL members receive a discount on a subscription to Gaming Law Review and Economics. Visit your membership portal to learn more and subscribe today. Articles should be between approximately 1,800 and 10,000 words (very roughly, 5 - 30pp in Word), inclusive of titles, section heads, and foot- or endnotes—either foot- or endnotes are acceptable. Articles should be well-supported by citations to caselaw, statutes, regulations, treatises, other journal articles, and/or the media, should be structured like a typical law review article, and should use Blue Book formatting—though we will copyedit formatting, so authors do not need to worry too much about this. We can publish black-and-white or greyscale charts, graphs, tables, and even photographs; such are welcome but not required. Articles can be about the law (present, historical, or recommended future) in regards in gaming, the economics of the gaming industry or its effect on its community, on gaming technology, and/or on social issues revolving around gaming.